Overall Rank: 10 to 100. Neucopia, evolved from the latin origin copia, which means “abundant” this supposed “cash giving” MLM program surfaced in (June 2012). These pyramid style payment models seem to be popping up endlessly and work under the idea of one person getting paid for recruiting another. Like many other pyramid programs (offer 100% commission on the first sale), this program offers this if you are a premium member which is a $169 per month. I’m not going to say too many good things about this program, simply because I’m getting fed up with so many people getting sucked into these “gray area”, borderline illegal pyramids. But I do want you read on, because I am going to fully explain the inner workings of the these programs and I am also going to give you a priceless advice as to what you can do to improve your financial situation. Quality video interviews within the Premium membership. Pyramid. You are promoting the product versus the actual quality of the service. Commissions are not was stated! The training material for this company is a third party and available for free in many places. support is almost unheard of! You only can promote Neucopia once you sign up. so it is the only source of income. commissions. So when you join Neucopia, you are paying to become an affiliate versus actually receiving any meaningful training. Basic Membership – Cost $49.95 per month Premier Level Membership – Cost $169.95 per month. How much do you earn for recruiting people to Neucopia? After signing up the first 2 or 3 people within Neucopia (depending on the level of your program), your earn $100 per Premier referral. there is no residual commissions, you only earn for the one time initial recruiting. For a basic member, the commissions are lower so they essentially force you into paying more money in order to earn higher commissions and to shorten the number of “pass ups” that you are required to perform. In short words this is an affiliate program that claims full 100% commissions, but when all is done, you are earning much less than claimed (because of qualifications, and of the requirement to pay a full Premium membership to earn the highest level, and because of the fact you only receive a certain percentage of sales and residuals in very limited circumstances). If you are a Premium member of the Neucopia , you get a $10 bonus for every $100 commission that your sponsored recruits generate. Pay attention to your average sponsored member will never experience enough success to get you these bonuses as the average MLM recruit is never able to sponsor more than 2 people into any given MLM program! This is when the Geannie starts to come out of the bottle! While it may appear as if they offer a decent range of products and tools, but these are all (Private Label Rights) products that they purchased from a third party. what they did is they bought rights to some cheap content , and some outdated tools (which will negatively impact your business if you use it), and put it all together to make up their membership make up. What I’m talking about here is very low grade training modules that you can buy yourself online for $39 . and get access to 1300 of them, much more than Neucopia even offers you! wow! Once again these products are not owned by Neucopia they were simply bought as part of a PLR package. Want to get a little more excited Go now! do a quick search in Google for either of these products, and see how you can access these low grade products for free. 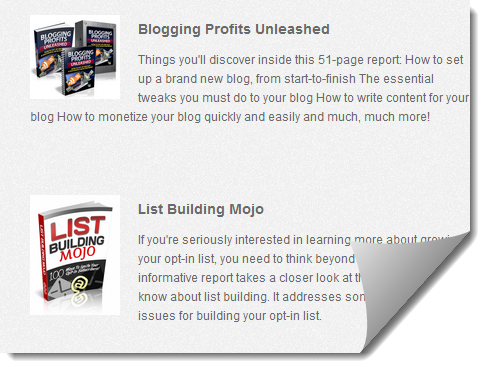 Under is an example of the “Blogging Profits Unleashed” product, which is 100% free to download and read! or one other hard way you could pay a monthly fee of $169 for this outdated blogging material within the Neucopia! from individuals they themselves don’t know what the hell they are doing! If you are looking for support and help creating a business, this is not the place to set your rocking chair. Includes a total of 34 PLR products. not a single one is by them. It was purchased from other companies for very cheap price only in the hundreds and now reselling it to you for $49.95 per month. These are outdated, low-end products and services and come with no supportive training and not scalable. You can as well go to a land fill and expect to find even better than this old outdated hording. Premier Level – $169.95 per month. manage any recruits in the first place. When getting into any “opportunity”, you need to determine what your goal is. Is it just money, or are your looking to create an actual business through the processes of creating a business. If you goal is just money “at any cost”, then this program may be for you. even though unethical, there is commission model there not to everyone! This program is the worst of the worst. It has little or no substance at all ! The only way to earn is to get others to the membership, there is no other way to earn outside this. You are selling “empty sacks” from one person to another. If you are truly looking for a true ethical online opportunity that will cost you nothing to start then this link may worth your click. My final impression about this is…..